JERUSALEM - Israeli officials harshly criticized an Egyptian television interview with soldier Gilad Schalit minutes after Hamas militants freed him in a prisoner swap Tuesday, saying the questioning was inappropriate and insensitive. A gaunt, pale and uncomfortable looking Schalit appeared to struggle to speak at points during the appearance on Egyptian state TV, and his breathing was noticeably labored as he awkwardly answered questions. The footage, along with earlier video showing Schalit being transferred to Egypt, were the first images seen of the soldier after more than five years in Hamas captivity. Hamas militants were in the area as the interview was being set up. One of them stood behind Schalit's chair, wearing a black face mask, a green headband of the Qassam brigades  Hamas' military wing  and filming with a video camera in his hand. "You have known what it is like to be in captivity," interviewer Shahira Amin said to Schalit. "There are more than 4,000 Palestinians in Israeli jails. Will you help campaign for their release?" she asked in English. Schalit took a long pause before answering, then said he would be happy if all those prisoners were freed so that they can go back to their families and loved ones. "What has the experience brought you? Has it made you stronger?" she asked at another point. And, brushing aside the fact Hamas had barred anyone from visiting Schalit, she asked why he only gave one interview while held captive. Schalit gasped for air, the handler suggested halting the interview because Schalit wasn't feeling well, and he didn't answer the question. Amin insisted Schalit had not been coerced to give the interview. An Israeli official questioned the ethics of the journalists involved. "We are all shocked that a so-called interview was forced on (Schalit) before he could even talk to his family or set foot on Israeli soil," the official said. He spoke on condition of anonymity because he was discussing a sensitive diplomatic matter, but said the sentiment was widely shared in official Israeli ranks. Israeli security officials told Israeli YNet News the interview was a violation of the deal for Schalit's release. However, an Egyptian security official said the interview and all the details of Schalit's handover went according to agreements between Israel, Egypt and Hamas. The official said Israel knew about the interview in advance. "The Egyptians didn't force him to give the interview. If he refused or if the Israelis refused, he wouldn't have given the interview," said the official, who spoke on condition of anonymity because he was not authorized to speak to the media. With Schalit's interview on state television, the Egyptians appeared to be trying to show the success of their mediation efforts at winning freedom for so many Palestinians at a time when the ruling military council, which took power after the ouster of President Hosni Mubarak in an uprising, has come under heavy criticism for mismanagement of the transitional period. The presenter even tried to get Schalit to credit the Egyptians, asking: "It was the Egyptian national security that mediated your release. There were previous failed mediation efforts including one by the Germans. Why do you think that this time the round of mediation was a success?" Egyptian reporter Salah Gomaa, who attended the interview, said that the room was packed, small and hot. Schalit stopped several times to catch his breath or to drink water. Gomaa said that the presenter insisted on asking questions in English and getting answers in English. "Schalit told her that he has not practiced his English for five years and it is better to speak Hebrew," Gomaa said. However, another Egyptian security official said the Egyptian information minister asked the intelligence chief for an exclusive interview with Schalit. It was not a condition in the deal but a request from Egypt. 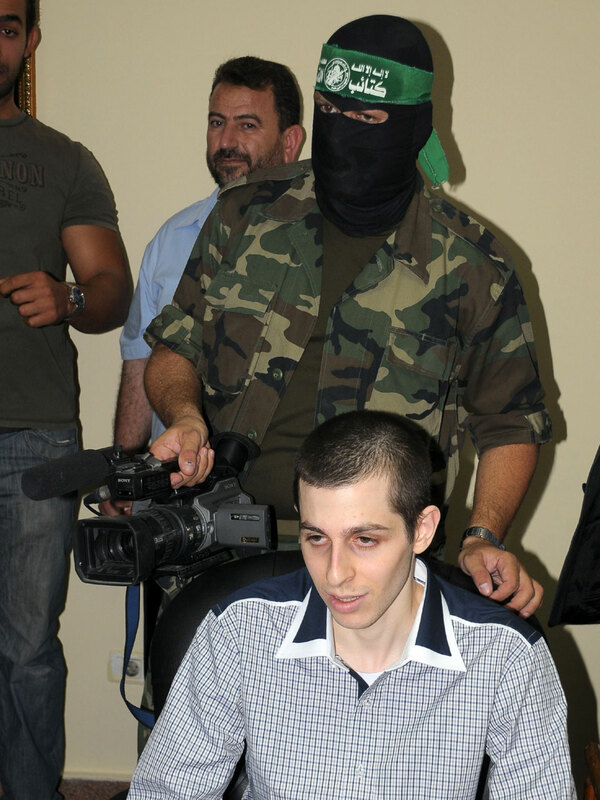 An ashen-faced Schalit answered a range of questions on his captivity and what he thought of the 1,027 Palestinian prisoners released for his freedom. He was then handed over to Israeli officials and only then given a medical examination, where doctors determined he showed signs of malnutrition and lack of exposure to sunlight. He called his family shortly afterward. Israeli media discussed the interview at length, with commentators calling it insensitive. Channel 10 commentator and presenter Raviv Drucker said her questions would "likely win the title of the stupidest questions of the past 100 years." "It wasn't the most sensitive thing to do. An interview forced on a prisoner just released is a low thing to do," Drucker said. Israeli TV anchor Yonit Levy called the interview "borderline torture"
Amin is a respected journalist within Egypt. During the Jan. 25-Feb. 11 Egyptian uprising she resigned from her job at Egyptian state television Nile TV, saying she did not want to be part of the "state propaganda regime." She told Israel's Channel 10 TV that she would not have forced Schalit to speak if he didn't want to, and he seemed willing to do so. Nonetheless, "he seemed extremely tired, thin and pale, voice very faint, very difficult to concentrate. I had to repeat the questions several times," Amin told The Associated Press. She acknowledged that he was accompanied by Hamas gunmen when he arrived for the interview. Earlier this week, major Israeli media outlets agreed not to disseminate new video or photos of the Schalits for 10 days following the release.